The development of tracking methods for automatically quantifying individual behavior and social interactions in animal groups has open up new perspectives for building quantitative and predictive models of collective behavior. In this work, we combine extensive data analyses with a modeling approach to measure, disentangle, and reconstruct the actual functional form of interactions involved in the coordination of swimming in Rummy-nose tetra (Hemigrammus rhodostomus). This species of fish performs burst-and-coast swimming behavior that consists of sudden heading changes combined with brief accelerations followed by quasi-passive, straight decelerations. We quantify the spontaneous stochastic behavior of a fish and the interactions that govern wall avoidance and the reaction to a neighboring fish, the latter by exploiting general symmetry constraints for the interactions. In contrast with previous experimental works, we find that both attraction and alignment behaviors control the reaction of fish to a neighbor. We then exploit these results to build a model of spontaneous burst-and-coast swimming and interactions of fish, with all parameters being estimated or directly measured from experiments. This model quantitatively reproduces the key features of the motion and spatial distributions observed in experiments with a single fish and with two fish. This demonstrates the power of our method that exploits large amounts of data for disentangling and fully characterizing the interactions that govern collective behaviors in animals groups. This entry was posted in Lit Review, Phil, Simulation on January 13, 2018 by pgfeldman. C&C is not in the citations, but overall this looks good. Add this to the initial game paper. The NOAA demo went well, it seems. This entry was posted in Phil, Rants, Writing on January 12, 2018 by pgfeldman. I also need to write up something on the spectrum that narratives cover between maps and lists. Why a scientific paper is more “mapish” than a murder mystery. This entry was posted in Paper, Phil, research on January 10, 2018 by pgfeldman. This entry was posted in Java, Paper, Phil, proposals on January 9, 2018 by pgfeldman. This page is part of the Research on Complex Systems Group at the Institute for Theoretical Biology at Humboldt University of Berlin.The site is designed for people interested in complex dynamical processes. The Explorables are carefully chosen in such a way that the key elements of their behavior can be explored and explained without too much math (There are a few exceptions) and with as few words as possible. 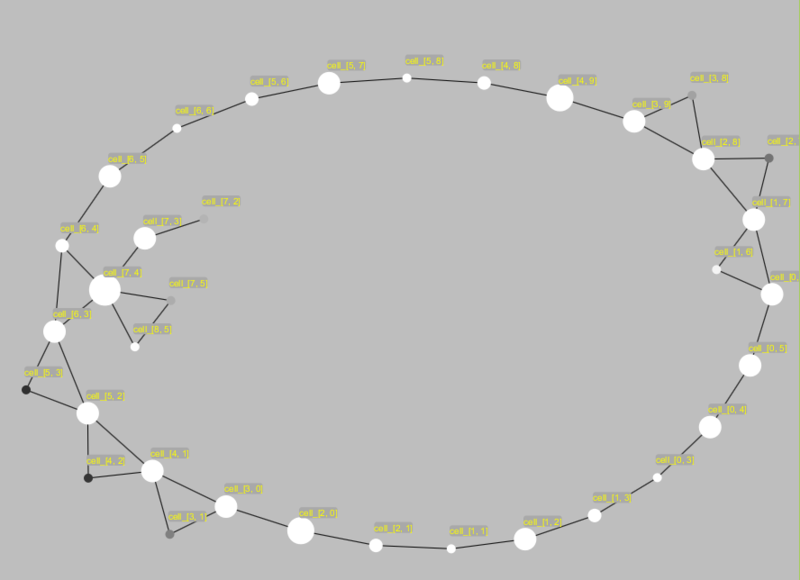 Orli’s Flock’n Roll (Adjustable variables, but just having the alignment radius doesn’t have the same effect. Maybe a function of the slew rate? We discuss models and data of crowd disasters, crime, terrorism, war and disease spreading to show that conventional recipes, such as deterrence strategies, are often not effective and sufficient to contain them. Many common approaches do not provide a good picture of the actual system behavior, because they neglect feedback loops, instabilities and cascade effects. The complex and often counter-intuitive behavior of social systems and their macro-level collective dynamics can be better understood by means of complexity science. We highlight that a suitable system design and management can help to stop undesirable cascade effects and to enable favorable kinds of self-organization in the system. 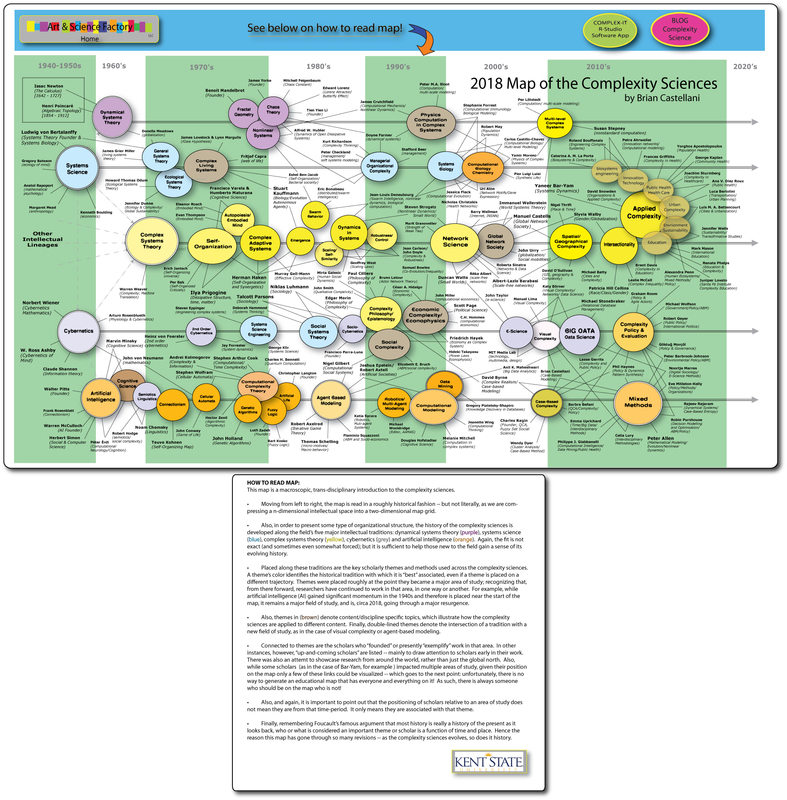 In such a way, complexity science can help to save human lives. Fooled around with the model definition section in the paper to bring forward the rate limited heading a bit. This entry was posted in Lit Review, Phil, proposals on January 8, 2018 by pgfeldman. This entry was posted in Paper, Phil, proposals on January 7, 2018 by pgfeldman. Listened to a Radiolab episode on emergence. Tweaking the paper – Done! Finished the annotated DB section of the whitepaper. This entry was posted in Paper, Phil, proposals on January 6, 2018 by pgfeldman. My keyboard has died. Waiting on the new one and using the laptop in the interim. It’s not quite worth setting up the dual screen display. Might go for the mouse though. On a side note, the keyboard on my Lenovo Twist is quite nice. The activity of hippocampal cell ensembles is an accurate predictor of the position of an animal in its surrounding space. One key property of hippocampal cell ensembles is their ability to change in response to alterations in the surrounding environment, a phenomenon called remapping. In this review article, we present evidence for the distinct types of hippocampal remapping. The progressive divergence over time of cell ensembles active in different environments and the transition dynamics between pre-established maps are discussed. Finally, we review recent work demonstrating that hippocampal remapping can be triggered by neurons located in the entorhinal cortex. This entry was posted in Machine Learning, Mapping, Paper, Phil, proposals, Simulation on January 5, 2018 by pgfeldman. One of the “fun” parts of working in ML for someone with a background in software development and not academic research is lots of hard problems remain unsolved. There are rarely defined ways things “must” be done, or in some cases even rules of thumb for doing something like implementing a production capable machine learning system for specific real world problems. There are companies that do not fall in this category for sure… either small companies who are more agile and can adopt a technology in the short term to retain relevance (or buzzword compliance), who are funded with external research dollars, or who invest money to stay pushing the bleeding edge. However, I think it’s fair to say, the majority of industry and federal customers are looking for stability and cost efficiency from solved technical problems. Machine Learning is in the odd position of being so tremendously useful in comparison to prior techniques that companies who would normally wait for the dust to settle and development and deployment of these capabilities to become fully commoditized are dipping their toes in. I wrote in a previous post how a lot of the problems with implementing existing ML algorithms boils down to lifecyle, versioning, deployment, security etc., but there is another major factor which is model optimization. Any engineer on the planet can download a copy of Keras/TensorFlow and a CSV of their organization’s data and smoosh them together until a number comes out. The problem comes when the number takes an eternity to output and is wrong. In addition to understanding the math that allows things like SGD to work for backpropogation or why certain activation functions are more effective in certain situations… one of the jobs for data scientists tuning DNN models is to figure out how to optimize the various buttons and knobs in the model to make it as accurate and performant as possible. Because a lot of this work *isn’t* a commodity yet, it’s a painful learning process of tweaking the data sets, adjusting model design or parameters and rerunning and comparing the results to try and find optimal answers without overfitting. Ironically the task data scientists are doing is one perfectly suited to machine learning. It’s no surprise to me that Google developed AutoML to optimize their own NN development. A number of months ago Phil and I worked on an unsupervised learning task related to organizing high dimensional agents in a medical space. These entities were complex “polychronic” patients with a wide variety of diagnosis and illness. Combined with fields for patient demographic data as well as their full medical claim history we came up with a method to group medically similar patients and look for statistical outliers for indicators of fraud, waste, and abuse. The results were extremely successful and resulted in a lot of recovered money for the customer, but the interesting thing technically was how the solution evolved. Our first prototype used a wide variety of clustering algorithms, value decompositions, non-negative matrix factorization, etc looking for optimal results. All of the selections and subsequent hyperparameters had to be modified by hand, the results evaluated, and further adjustments made. When it became clear that the results were very sensitive to tiny adjustments, it was obvious that our manual tinkering would miss obvious gradient changes and we implemented an optimizer framework which could evaluate manifold learning techniques for stability and reconstruction error, and the results of the reduction clustered using either a complete fitness landscape walk, a genetic algorithm, or a sub-surface division. A method recommended by Geoff Hinton is to add layers until you start to overfit your training set. Then you add dropout or another regularization method. Because so much of what Phil and I do tends towards the generic repeatable solution for real world problems, I suspect we’ll start with some “common wisdom heuristics” and rapidly move towards writing a similar optimizer for supervised problems. This entry was posted in Aaron, Development, Machine Learning on January 4, 2018 by apdant. As I mentioned in my previous post, one of our big focuses recently has been on time series data for either predictive analysis or classification. The intent is to use this in concert with a lot of other tooling in our framework to solve some real-world applications. One example is a pretty classic time series prediction problem with a customer managing large volumes of finances in a portfolio where the equivalent of purchase orders are made (in extremely high values) and planned cost often drifts from the actual outcomes. The deltas between these two are an area of concern for the customer as they are looking for ways to better manage their spending. We have a proof of concept dashboard tool which rolls up their hierarchical portfolio and does some basic threshold based calculations for things like these deltas. 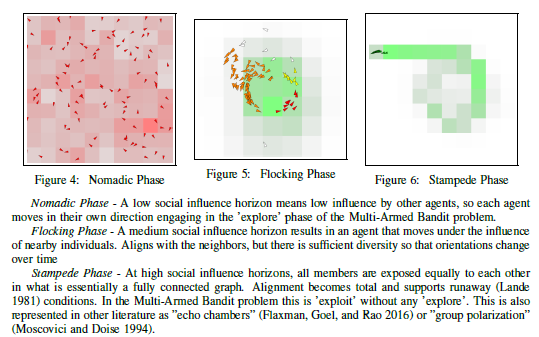 A much more complex example we are working on in relationship to our trajectories in belief space is the ability to identify patterns of human cultural and social behaviors (HCSB) in computer mediated communication to look for trustworthy information based on agent interaction. One small piece of this work is the ability to teach a machine to identify these agent patterns over time. We’ve done various unsupervised learning which in combination with techniques such as dynamic time warping (DTW) have been successful at discriminating agents in simulation, but has some major limitations. For many time series problems a very effective method of applying deep learning is using Recurrent Neural Networks (RNN) which allow history of the series to help inform the output. This is particularly important in cases involving language such as machine translation or autocompletion where the context of the sentence may be formed by elements spoken earlier in the text. Convolutional networks (CNNs) are most effective when the tensor elements have a distinct positional meaning in relationship to each other. The most common examples is a matrix of pixel values where the value of the pixel has a direct relevance to nearby pixels. This allows for some nice parallelization, and other optimizations because you can make some assumptions that a small window of pixels will be relevant to each other and not necessarily dependent on “meaning” from pixels somewhere else in the picture. This is obviously a very simplified explanation, and there are lots of ways CNNs are being expanded to have broader applications including for language. In any case, despite recent cases being made for CNNs being relevant for all ML problems: https://arxiv.org/abs/1712.09662 the truth is RNNs are particularly good at sequentially understood problems which rely on the context of the entire series of data. This is of course useful for time series data as well as language problems. Training LSTMs isn’t much different than training any NN, it uses backpropogation against a training and validation set with configured hyperparemeters and the layout of the layers having a large effect on the performance and accuracy. For most of my work I’ve been using Keras & TensorFlow to implement time series predictions. I have some saved code for doing time series classification, but it’s a slightly different method. I found a wide variety of helpful examples early on, but they included some not obvious pitfalls. Note: The configurations used in this example suffices to explain how LSTMs work, but the accuracy and performance isn’t good. A single layer of a small number of LSTM cells running a large number of epochs of training results in pretty wide swings of predictive values which can be demonstrated by running a number of runs and comparing the changes in the RMSE scores which can be wildly off run-to-run. His examples are far more robust including stacked LSTM layers, far more LSTM units per layer, and well characterized sample data as well as more “realistic” stock data. He uses windowing, and non-stationary data as well. He has also replied to a number of comments with detailed explanations. This guy knows his stuff. This entry was posted in Aaron, Machine Learning on January 4, 2018 by apdant. It’s been a while since I’ve posted my status, and I’ve been far too busy to include all of the work with various AI/ML conferences and implementations, but since I’ve been doing a lot of work specifically on LSTM implementations I wanted to include some notes for both my future self, and my partner when he starts spinning up some of the same code. Having identified a few primary use cases for our work; high dimensional trajectories through belief space, word embedding search and classification, and time series analysis we’ve been focusing a little more intently on some specific implementations for each capability. While Phil has been leading the charge with the trajectories in belief space, and we both did a bunch of work in the previous sprint preparing for integration of our word embedding project into the production platform, I have started focusing more heavily on time series analysis. There are a variety of reasons that this particular niche is useful to focus on, but we have a number of real world / real data examples where we need to either perform time series classification, or time series prediction. These cases range from financial data (such as projected planned/actual deltas), to telemetry anomaly detection for satellites or aircraft, among others. In the past some of our work with ML classifiers has been simple feed forward systems (classic multi layer perceptrons), naive Bayesian, or logistic regression. I did some research into the progress of current deep learning frameworks as well, looking specifically at examples which were suited to production deployment at scale over frameworks most optimal for single researchers solving pet problems. Our focus is much more on the “applied ML” side of things rather than purely academic. The last time we did a comprehensive deep learning framework “bake off” we came to a strong conclusion that Google TensorFlow was the best choice for our environment, and my recent research validated that assumption was still correct. In addition to providing TensorFlow Serving to serve your own models in production stacks, most cloud hosting environments (Google, AWS, etc) have options for directly running TF models either serverless (AWS lambda functions) or through a deployment/hosting solution (AWS SageMaker). The reality is that lots of what makes ML difficult boils down to things like training lifecycle, versioning, deployment, security, and model optimization. Some aspects of this are increasingly becoming commodity available through hosting providers which frees up data scientists to work on their data sets and improving their models. Speaking of models, on our last pass at implementing some TensorFlow models we used raw TensorFlow I think right after 1.0 had released. The documentation was pretty shabby, and even simple things weren’t super straightforward. When I went to install and set up a new box this time with TensorFlow 1.4, I went ahead and used Keras as well. Keras is an abstraction API over top of computational graph software (either TensorFlow default, or Theano). Installation is easy, with a couple of minor notes. Note #1: You MUST install the specific versions listed. I cannot stress this enough. In particular the cuDNN and CUDA Toolkit are updated frequently and if you blindly click through their download links you will get a newer version which is not compatible with the current versions of TensorFlow and Keras. The software is all moving very rapidly, so its important to use the compatible versions. Note #3: You will need to run the TensorFlow install as sudo/administrator or get permission errors. This includes basic examples of most of the basic DNN types supported by Keras as well as some datasets for use such as MNIST for CNNs. When it comes to just figuring out “does everything I just installed run?” these will work just fine. A bit on the idea that Neural Coupling is an aspect of the Willing Suspension of Disbelief. More tweaking on the paper. Waaaaaayyyyyy to many “We” in the abstract. Done through modeling. Need to generate nomadic, flocking, and stampede generated maps. Done! See below. Stable Nomad behavior map: Good overall coverage as you would expect. Some places have more visitors (the bright spots), but there are no gaps in the belief space. 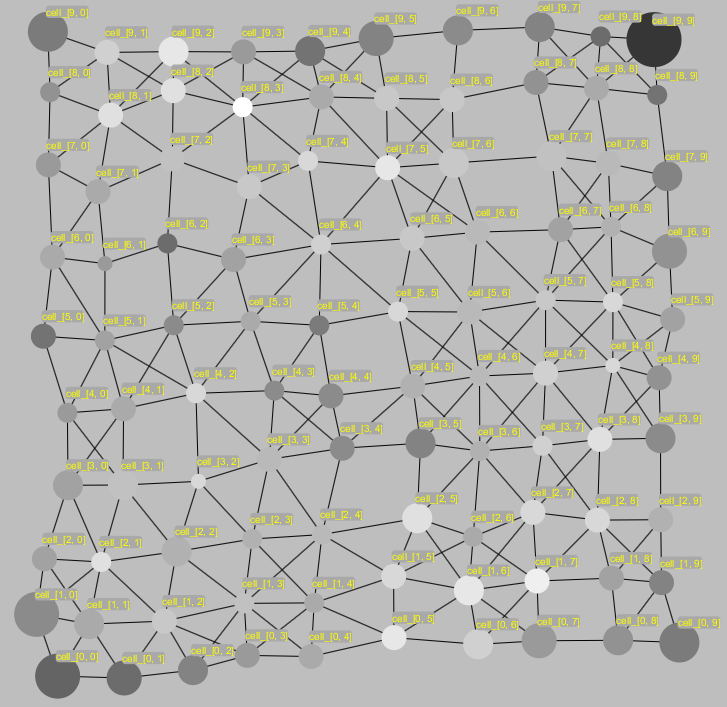 Stable Flocking behavior map: We can see gaps start to appear in the belief space, but the overall grid structure is still visible at the center of the network where the flock spent most of its time. This is also evident in the bright ring of nodes that represents the cells that the flock traversed while it was orbiting the center area. Stable stampede behavior map: Here, the relationship of the trajectories to the underlying coordinate frame is completely lost. In this case, the boundary of the simulation was reflective, so the stampede bounces around the simulation space. 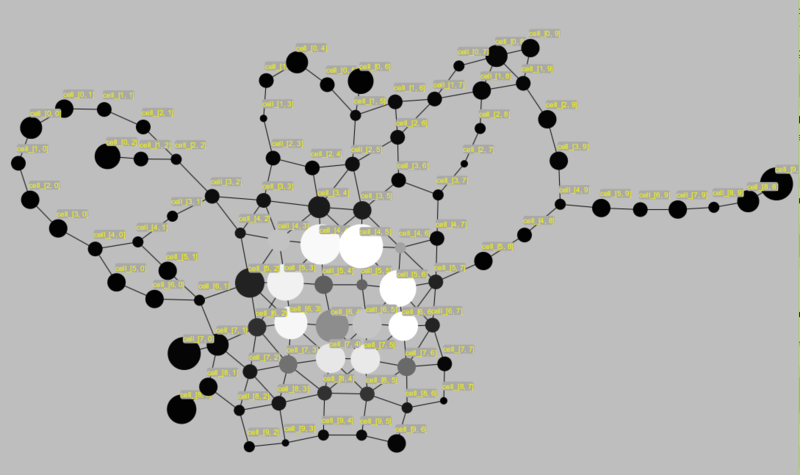 The reason that there is a loop rather than a line is because the tight cluster of agents crossed its path at some point. What could be interesting it to overlay the other graphs on the nomad-produced map. We could see the popular (exploitable) sections of the flocking population while also seeing the areas visited by the stampede. The assumption is that the stampede is engaged in untrustworthy behavior, so those parts would be marked as ‘dangerous’, while the flocking areas would marked as a region of ‘conventional wisdom’ or normative behavior. This entry was posted in Lit Review, Machine Learning, Paper, Phil, proposals on January 3, 2018 by pgfeldman.